So i’m back again for my monthly favorites which i’m so always good in not doing it every month because of the wedding preparation and the wedding itself. Hopefully by the upcoming month i’ll be posting every month(crossing fingers). 1. MAYBELLINE Define a Brow in Dark Brown - I almost forgot about this one because I’m so in a mood of a quick look so I often use my Missha Brow kit. But when I’m in the Philippines i brought it and started using it again and I noticed the difference of doing a more define brow than a trashy quick one. Unfortunately when I went back to UAE and was planning to buy more it was phased out. I think everyone hate it and feel so angry when they found something that works so well with them and suddenly the brand will phase them out. I hope Maybelline will realize that. 2. MAC LIPSTICK in Sweetie - This is a lustre finish from MAC. The color was described as ultra-sweet pink. I love this shade of lipstick it brings out a simple pop of Spring to your face. Specially for an everyday look which I always like because I don’t wear much color for work. Plus pink gives you a youthful glow so for now this is my everyday-go-to lipstick. It’s also moisturizing which I love about Lustre finish but the downside of this mostly of Lustre finishes is less pigmented compared to other finish from MAC so you tend to apply more. 3. BENEFIT They’re Real Mascara - Usually when it comes to mascara I often grab from drugstore brands like Maybelline, Covergirl, Loreal and Revlon beacause I think it works so well compared to high end brands plus, I can’t justify buying a high end mascara and throw them after a month or so. This mascara was so loved by most of the Guru’s so I get so interested with it and just before our vacation I grab one in Sephora to try. It cost AED120.00 so it’s twice the price of the drugstore one. The result is pretty good but i’m not amazed. Will do a review on it soon. 4. MAC Studio Fix Powder in NC 40 - When it comes to foundation I always comes back to MAC because the shades really blends do well with my skin tone. Most of the other foundation either made me look gray or too pink for me. I’m trying to avoid liquid foundation during this time of the year when all sweat is coming out of my body so I always stick with powder foundation or concealer and just powder. Since this is a powder foundation it’s good in absorbing oil on your face and it feels light compared to liquid or cream foundation. You still can see that it covers up some light skin discoloration but not a very dark one you still need concealer if you want to cover up dark discoloration. 5. ZOYA NAIL POLISH in Piaf - I started to practice doing my nails so I can change my nail color whenever I want to. So there’s a new nail salon called Nail Symphony across our villa and they’re selling some brands aside from Essie which I adore. 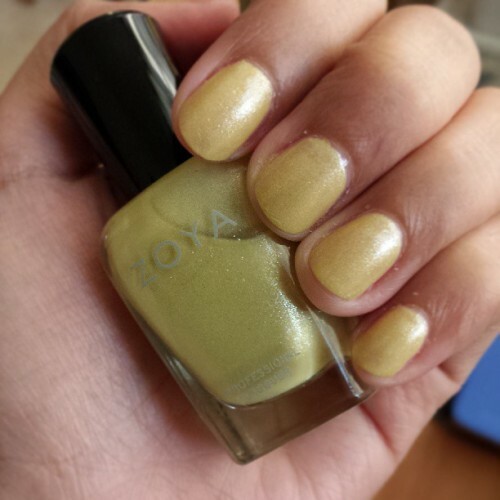 They told me to try Zoya because it’s organic and safe for pregnant woman though I’m not pregnant yet I think this will be useful when I am so I tried it and I swear it’s so amazing ans so easy to apply. Usually a polish will stay on my nails for 3 days and will start chipping but with Zoya it stayed for a week with no chipping. It really wowed me and will try some more shades soon. 6.UNIQLO Women Leggins - I’m a super fan of Leggins because of it’s comfortable feeling when I wore it. When we went to HK near our hotel in Causeway was this shop called UNIQLO and was so attracted with the colorful design and prints. When bumped into the leggins section I was caught by the texture and thickness of their leggins and sometimes when it comes to leggins I wanted to grab every color I can but thinking of our allowed luggage I can’t so I grab 4 colors. I’ts so soft and so nice to wear. I just love em! If you have the same store on your place try their line and have fun.